Another day, another well-reviewed burger. Fat Bruce Lee owed me big time, so he took me to Westside Tavern as my "reward." Q: What do all of the things listed below have in common? How is everything with your meal, gentlemen? Can I refill your drink, sir? Are you interested in dessert today? May I bring your check? A: They are all questions. They are all things that one typically hears while in the role of customer at a dining establishment. They all things that were not uttered to us during our visit at Westside Tavern. The Beef: Chuck--USDA Prime Chuck. It had just a faint hint of aging and that showed up as a muted back note rather than a front note. The beef, because we had it cooked to Medium, was rich with beefy flavors. Sadly, the Chuck was poor in bloody, iron flavors. The Sear: Hell yeah--Fat Bruce Lee did a back flip over this! 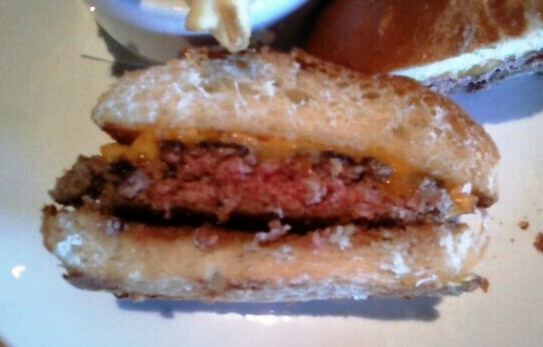 The sear on The Cheeseburger ($13) was mighty. It was a crunchy, thick, thorough sear from a very hot grill. The sear was strong enough to have a hint of carbon, which gave the large patty a backyard cookout flavor. The Seasoning: This was weak. There was a hint of seasoning on the exterior of the (7 oz.) patty, but it was meager and not nearly enough to make up for the carbon in the sear, the lack of seasoning in the blend, or the inherent blandness of the Chuck in this $13 burger. 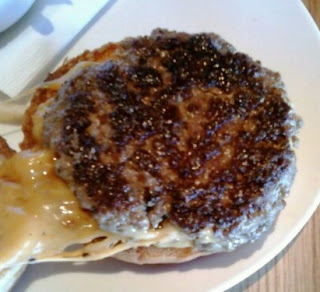 The Preparation: The beef was coarsely ground and loosely packed into MASSIVE patties. They nailed the Medium request, and the beef remained very juicy. The juices saturated the bottom bun, so that was nice. The Cheese: It was that ho-hum Tillamook Cheddar. Greasy, rubbery, bland Tillamook Cheddar. Why? The cheese brought NOTHING to the party--no savory, no umami, no creaminess. Standard, American cheese would have suited this under-seasoned dish far better. The Bun: Where did it come from? Who cares? It was a big, spongy, DRY, and flaky. The bun was a poor pairing to that burger. The Fries: They were fine. The Value: Look, Umami Burger and Wolfgang's Steakhouse have set the bar REALLY high in terms of value. 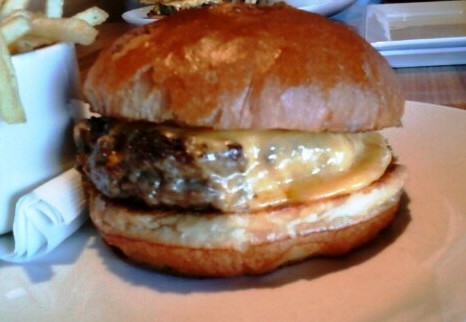 We could have gotten great cheeseburgers at either place for the same amount of dough, so the cheeseburger value was not great at Westside Tavern. The burger at Westside Tavern was competently cooked, but it was cobbled together with ingredients, which did nothing to play to the beef's strengths. It seemed quite clear that The Cheeseburger was the result of the Chef being forced to check the "burger box" on the menu and nothing more. Burger Review : Average burger for a premium price.